This morning in Huntington at 7:00AM it’s currently 11 degrees under overcast skies. Winds are calm. Relative humidity is 88%, dewpoint 9, barometric pressure 30.25” and falling. We have 3” of snow at the stake. Yesterday’s high was 18, and the overnight low was 8. A fairly quiet day on tap to end 2014. We’ll see cloudy skies with scattered lake effect snow showers this morning. Highs will be around 19 with west winds around 10 mph. Chance of snow is 30% with minor accumulations in our area. Tonight should be cloudy with a slight chance of snow showers after midnight. Lows will be around 13 with southwest winds 10 to 15 mph gusting up to 25 mph. Chance of snow is 20%. Thursday—New Year’s Day—should be cloudy with a 40% chance of lake effect snow showers. Highs will be in the mid 20s with southwest winds 10 to 15 mph gusting up to 25 mph. Thursday night should be cloudy with a 50% chance of snow showers. Lows will be around 16 with west winds 10 to 15 mph gusting up to 25 mph. A cold front will swing through the region Friday bringing more lake effect snow showers with light snow accumulation possible. Highs will be in the mid 20s with west winds around 10 mph. Chance of snow is 60%. Friday night should be partly cloudy with lows around 10 above. Last year on this date we had a high of 16 and a low of 2. We had 4.75″ of snow on the ground. Burlington norms for this date are highs of 29 and lows of 13. The record low was -19°F in 1963). Tomorrow will be 0m48s longer. The Moon is waxing gibbous, 9d 10h old with 78% illumination. 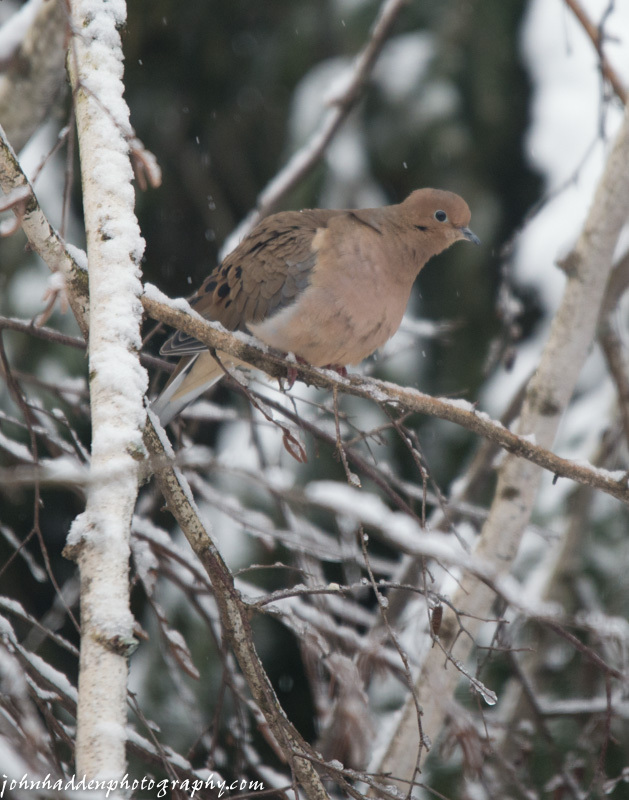 We’ve got a frequent flock of mourning doves visiting our feeders this season. Usually I see them in pairs, but this year we’ve got a group of six to eight (always an even number it seems!) arriving and hanging out in the bent birch. Nikon D600, Sigma 120-400mm lens @ 400mm, ISO 1250, f/5.6, 1/400″ exposure. This morning in Huntington at 7:30AM it’s currently a brisk 10 degrees under clear skies. Winds are calm. Relative humidity is 76%, dewpoint 4, barometric pressure 30.38” and rising. We have 3” of snow at the stake. Yesterday’s high was 32, and the overnight low was 10. A sprawling area of high pressure will continue to affect our region for the next several days delivering chilly, dry conditions. We’ll see mostly sunny skies today with highs around 17 and northwest winds around 10 mph. Tonight should be mostly clear until midnight, then become partly cloudy. Lows will be around 6 above with light and variable winds. Wednesday should be mostly cloudy with highs around 20 and light and variable winds, becoming westerly around 10 mph in the afternoon. Wednesday night should be cloudy with lows around 12 and southwest winds 10 to 15 mph gusting up to 25 mph. Thursday’s looking cloudy with a 30% chance of (Great Lakes) lake effect snow showers. Highs will be in the mid 20s with southwest winds 15 to 20 mph. Thursday night should be mostly cloudy with a 40% chance of snow showers. Lows will be 10 to 15. Last year on this date we had a high of 34 and a low of 0. We picked up 0.23″ of rain and had 4.75″ of snow on the ground. The Moon is waxing gibbous, 8d 11h old with 69% illumination. 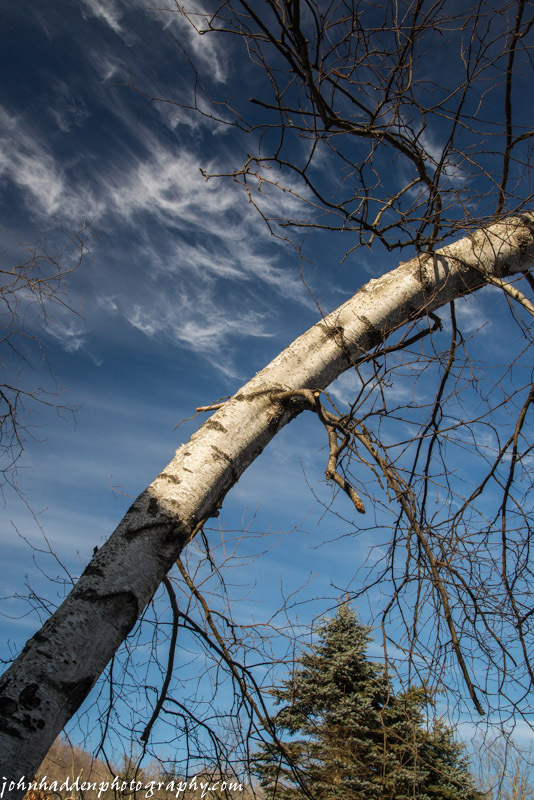 While some of the birch trees around our house have mostly recovered a somewhat upright posture, one that was bent to the ground by the front deck is still “reposing”… High cirrus clouds yesterday midday enliven the scene. Nikon D600, Nikon 24-120mm lens @ 31mm, ISO 800, f/14, 1/125” exposure. This morning in Huntington at 8:00AM it’s currently 26 degrees and snowing under mostly cloudy skies. Winds are out of the west at 3-6 mph. Relative humidity is 80%, dewpoint 20, barometric pressure 30.13″ and rising rapidly. We picked up a dusting of snow overnight and have 3.5″ at the stake. Yesterday’s high was 47, and the overnight low was 26. A weak shortwave trough will move across the region this morning bringing a chance for snow showers. This will be followed by dry high pressure and much colder temperatures through the middle of the week. We’ll see partly sunny skies with a chance of snow showers mainly this morning. Highs will be in the upper 20s with northwest winds around 10 mph gusting up to 30 mph. Chance of snow is 40%. Tonight should be mostly clear until midnight, then become partly cloudy. Lows will be around 8 above with northwest winds around 10 mph. Tuesday should be partly sunny and chilly with highs around 18 and northwest winds around 10 mph. Tuesday night should be partly cloudy with lows around 4 above and light and variable winds. Wednesday’s looking partly sunny with highs around 19 and west winds around 10 mph. Wednesday night should be partly cloudy with lows 10 to 15. Last year on this date we had a high of 44 and a low of 25. We had 5.8″ of snow on the ground. Tomorrow will be 0m39s longer. The Moon is waxing gibbous, 7d 11h old with 59% illumination. This morning in Huntington at 8:00AM it’s currently 34 degrees under overcast skies. Winds are calm. Relative humidity is 96%, dewpoint 33, barometric pressure 30.18”. Snowpack is hanging in at 4”. Yesterday’s high was 42, and the overnight low was 30. A ridge of high pressure will keep the region dry through the daylight hours today, before moving offshore this evening. A cold front will move in from the west bringing rain and snow showers tonight. Drier and colder air will filter in behind the cold front, kicking off a colder trend for the upcoming work week. We’ll see cloudy skies today with highs in the lower 40s and light and variable winds, becoming southwesterly around 10 mph this afternoon. Tonight should be cloudy with a 50% chance of rain showers. Lows will be in the upper 30s with southwest winds 15 to 20 mph. Sunday should be mostly cloudy with a slight chance of rain showers in the morning. Highs will be around 40 with west winds 10 to 15 mph, becoming northwesterly in the afternoon. Chance of rain is 20%. Sunday night should be partly cloudy with lows in the lower 20s and northwest winds around 10 mph. Monday’s looking partly sunny with highs in the mid 20s and northwest winds around 10 mph. Monday night should be partly cloudy with lows 5 to 10 above. Last year on this date we had a high of 28 and a low of 12. We picked up 2.5″ of snow and had 6.5″ on the ground. Burlington norms for this date are highs of 30 and lows of 14. The Moon is a waxing crescent, 5d 11h old with 36% illumination. I took this shot on Solstice Eve. 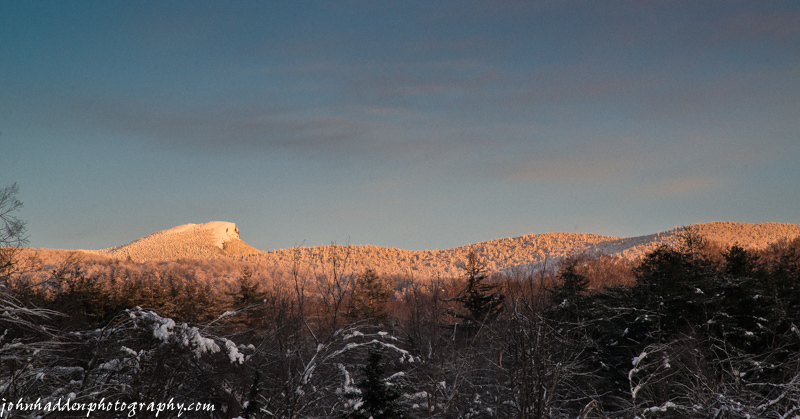 The Hump looks much different now with practically all of the snow and rime ice melted away. Nikon D600, Nikon 24-120mm lens @ 120mm, ISO 800, f/11, 1/200″ exposure. This morning in Huntington at 7:35AM it’s currently 37 degrees under overcast skies. Winds are calm. Relative humidity is 78%, dewpoint 31, barometric pressure 30.11” and rising rapidly. Our snowpack is down to 4”. Yesterday’s high was 58 (at 4:33AM) and the overnight low was 34. We picked up a total of 0.59” of rain from the storm, and Fargo Brook was running pretty high by yesterday morning. Our snowpack took a pretty good hit, but we’ve still got some goods on the ground! A weak ridge of high pressure will bring dry and mild conditions to the region today and Saturday, though skies will remain partly to mostly cloudy. A cold front moving in from the west will bring scattered rain and snow showers Saturday night with light snow accumulations possible across the higher terrain. We’ll see mostly cloudy skies today with highs in the lower 40s and west winds 10 to 15 mph. Tonight should be cloudy with a slight chance of snow showers after midnight. Lows will be around 30 with light and variable winds. Chance of snow is 20%. Saturday should be cloudy and continued mild with highs in the lower 40s and light and variable winds, becoming southerly around 10 mph in the afternoon. Saturday night should be cloudy with a chance of rain or snow showers. Lows will be in the lower 30s with south winds 10 to 15 mph. Chance of precipitation is 50%. Sunday’s looking mostly cloudy with a chance of rain showers as a cold front moves through. Highs will be in the upper 30s with west winds 10 to 15 mph. Chance of rain is 40%. Sunday night should be partly cloudy with lows in the lower 20s. Last year on this date we had a high of 26 and a low of 15. We picked up 0.25″ of snow and had 4.25″ on the ground. The Moon is a waxing crescent, 4d 11h old with 25% illumination. 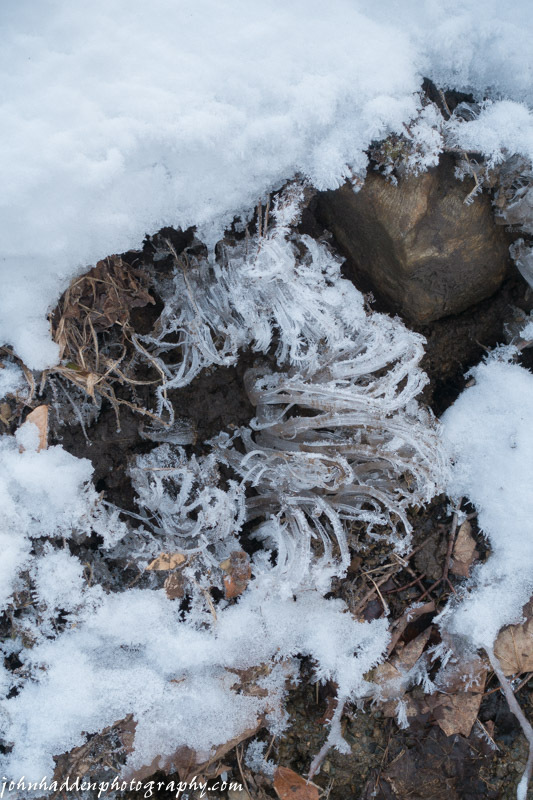 I came across these curling frost fingers curling out of the ground up along a cutbank on the Camel’s Hump Nordic ski trails the other day (before the rain obviously…) They were a good 5-6 inches long! This morning in Huntington at 6:30AM it’s currently 41 degrees under overcast skies. Winds are variable at 0-3 mph. Relative humidity is 89%, dewpoint 38, barometric pressure 29.99”. We picked up 0.07” of rain in the past 24hrs. Snowpack is down to 9.5”. Yesterday’s high was 43, and the overnight low was 40. There is an Areal Flood Watch in effect for our region from this evening until Friday morning. The thaw is upon us. Morning radar imagery paints a complex picture of warm fronts and low pressure systems bringing lots of moisture and warm temperatures out of the Gulf states and into our region today. We’ll see rain and drizzle this morning, then periods of rain this afternoon. Highs will be in the mid 40s with southeast winds 15 to 20 mph. Chance of rain is near 100%. Rain will continue into tonight and be heavy at times. Lows will be in the lower 40s with south winds 15 to 20 mph. Chance of rain is near 100%. Christmas day will be cloudy with showers likely in the morning, then becoming partly sunny with a slight chance of showers in the afternoon as a cold front swings through finally turning off the tap. It’ll be breezy with highs in the mid 40s and southwest winds 15 to 25 mph gusting up to 35 mph. Chance of rain is 70%. Thursday night should be partly cloudy and breezy with lows in the lower 30s and west winds 20 to 25 mph gusting up to 45 mph. Friday’s looking partly sunny with highs in the upper 30s and southwest winds around 10 mph. Friday night should be partly cloudy with lows in the upper 20s. Last year on this date we had a high of 25 and a low of 5. We picked up 0.08″ of rain and had 3.5″ of snow on the ground. Burlington norms for this date are highs of 30 and lows of 15. The record high was 51°F in 1941. The record low was -18°F in 1989. Tomorrow will be 0m16s longer. The Moon is a waxing crescent, 2d 10h old with 8% illumination. 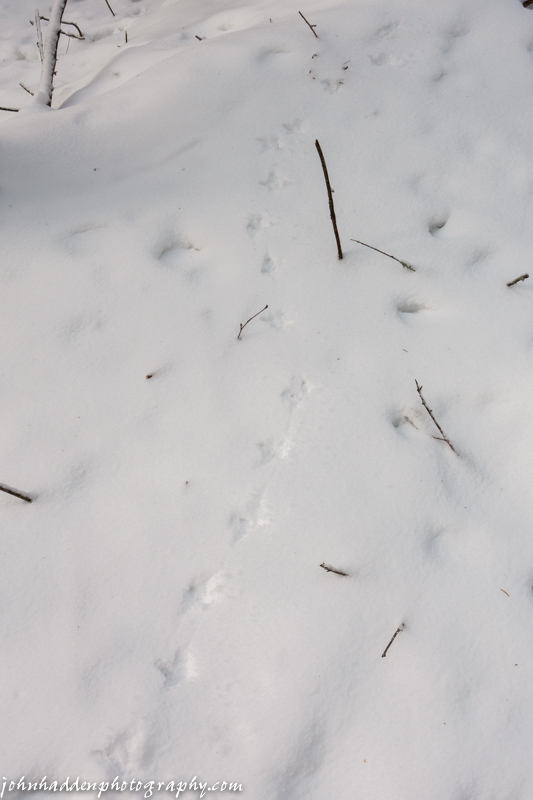 More snow stories: I came across this set of ruffed grouse tracks while skiing up at Camel’s Hump Nordic the other day. They marched right across the trail and up into the woods. The snow had a very light crust on it that the bird just barely broke through. This morning in Huntington at 6:35AM it’s currently 37 degrees and raining under overcast skies. Winds are variable 0-4 mph. Relative humidity is 89%, dewpoint 35, barometric pressure 30.21” and falling. We’ve picked up 0.09” of rain overnight. Snowpack is 12”. Yesterday’s high was 38, and the overnight low was 33. A major warmup is expected across the region beginning today. An initial warm front will bring mixed wintry precipitation this morning followed by periods of light rain this afternoon through tonight. A second stronger low pressure system forming in the Ohio River valley Wednesday will allow for a northward surge of Gulf coast moisture and warmer temperatures. We’ll see rain, snow or sleet this morning, then rain this afternoon. Expect little or no snow or sleet accumulation. Highs will be in the upper 30s with southeast winds 10 to 15 mph gusting up to 30 mph. Chance of precipitation is near 100%. Tonight will bring rain with patchy fog after midnight. Lows will be in the upper 30s with southeast winds 10 to 15 mph. Chance of rain is 80%. Wednesday will bring more rain as the second low moves in from the southwest. Highs will jump into the upper 40s with south winds 10 to 15 mph. Chance of rain is near 100%. Rain will continue into Wednesday night, becoming heavy at times. Lows will be in the lower 40s with south winds 15 to 20 mph. Chance of rain is near 100%. Last year on this date we had a high of 33 and a low of 25. 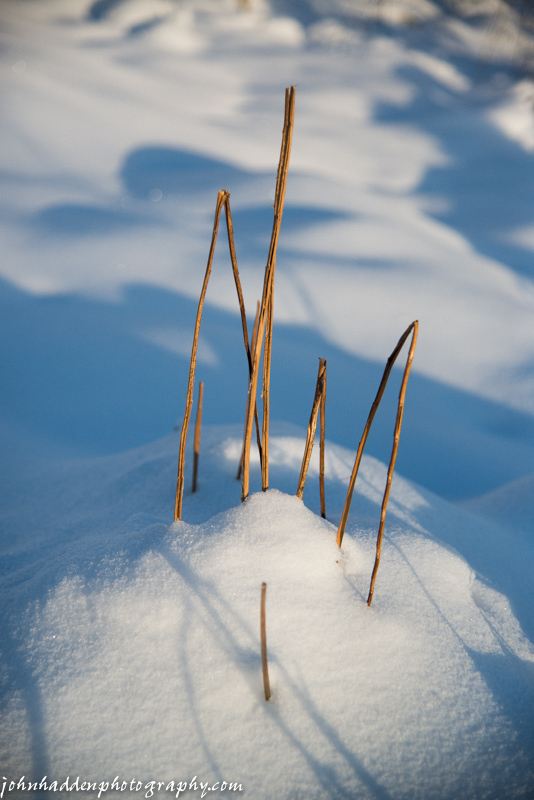 We picked up 0.09″ of rain and had 3.75″ of snow on the ground. Burlington norms for this date are highs of 31 and lows of 15. The record high was 58°F in 1990. The record low was -18°F in 1955. Tomorrow will be 0m11s longer. The Moon is a waxing crescent, 1d 10h old with 3% illumination. 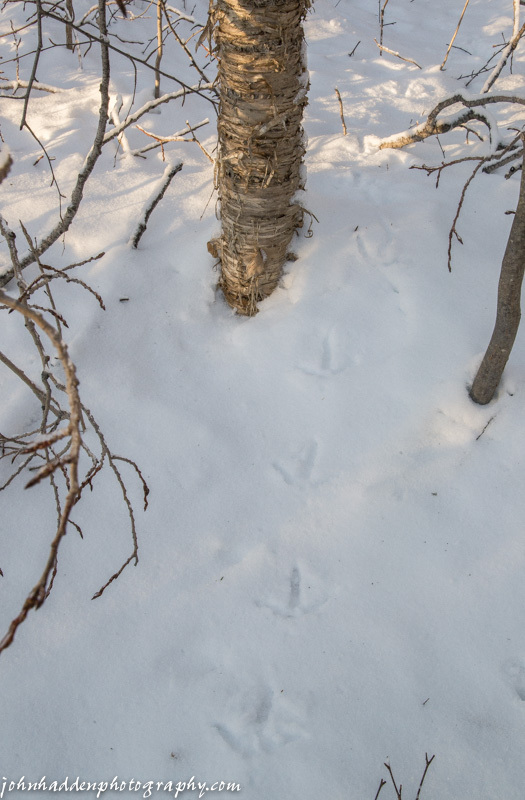 More stories in the snow: two sets up turkey tracks show a pair of birds marching down to Fargo Brook, crossing the stream, and heading up into the woods on the other side. Nikon D600, Nikon 24-120mm lens @ 44mm, ISO 400, f/16, 1/80″ exposure.